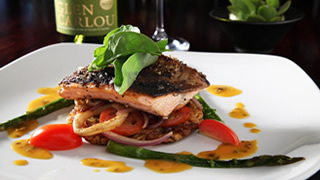 Glen Carlou Restaurant is situated on the Glen Carlou Wine Estate outside Franschhoek towards Paarl. Glen Carlou Restaurant plants its flag firmly in the field of contemporary cuisine. Continental influences are paired with top-quality local produce – think of ostrich fillet glazed in whole grain mustard and served with a biltong croquette. The choice for vegetarians are limited at Glen Carlou, but what there is shows plenty of thought. There is no shortage of creativity in the kitchen and this is certainly one of the more interesting menus in that corner of the Cape Winelands. The Glen Carlou Restaurant opened its doors in June 2007 in the heart of South Africa’s Cape Winelands. This restaurant offers breathtaking views of the Paarl valley. The food is fresh and innovative with a classical French undertone which also brings local flavours to the table. Glen Carlou is ideal for weddings and the team will create a sophisticated and elegant event with sumptuous food and wines.